Joel Osteen, pastor of Lakewood Church in Houston, Texas, revealed that he has a personality that "wants people to like me" but he has accepted the reality that some people won't. "My personality type is that I want people to like me. This is my nature. I got into the public eye, and I realized that some people won't like you because they don't like what I stand for. They don't like that I'm successful. But I realized that you won't get everyone to like you," Osteen said at Lifepoint Church in Virginia where he promoted his new book, Next Level Thinking. 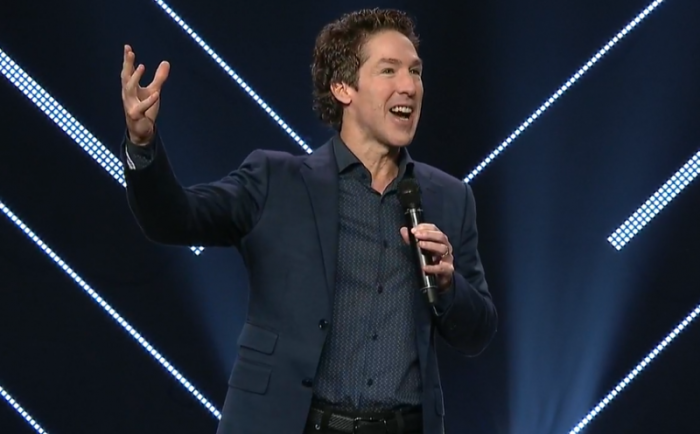 Before delving into a discussion with Lifepoint Church's Senior Pastor Daniel Floyd, Osteen told the 1,650 people who had gathered to hear him speak that he didn't come prepared with a special message but ended up sharing one anyway. "I believe that God can take you places that you can't go on your own. When you honor God with your life, when you keep Him first place, you don't know what kind of door God's gonna open. Never dreamed I'd be a minister, never dreamed I'd be up here with y'all tonight, but you know what? God's plan for your life is bigger than your own," he said. He said at one point while working behind the scenes for his father doing video production that was all he thought he would be until God interrupted that thinking. "You know, I worked 17 years behind the scene at my father's church doing the production. I thought that's what I would do with my whole life. My dad would speak a message and I would have to edit it down for a television program to 25 minutes. He'd speak for 40 minutes. So all those years, I would listen to each message each weak probably four or five times. Never dreamed that one day I would be a minister. But I look back now and realize God was getting me prepared for what I'm doing right now," he said. He explained that the main message of his new book, released Tuesday, is that your life follows your thoughts and warned about the importance of protecting your thoughts when Floyd mentioned the struggle to do just that when people tend to frequently compare themselves to others. "We live in such a comparison age. I know especially in ministry, I know you didn't know 20 years ago what some ministers did and there was no Instagram to look at. And even outside of ministry, in life, we can sometimes compare our behind the scenes to somebody else's highlight real and we want to end up being them, and God's just giving us grace to be us," Floyd said and Osteen agreed. "We're living in this day where you feel good about yourself until you get on Instagram. So just be confident with what God gave you," Osteen said. "When God breathed his life into you he equipped you and empowered you with everything you need." He then noted how a chapter in his new book, You Are Fully Loaded touches on that. "I think sometimes we live from a lack mentality," Osteen said. "As long as you think you're lacking it's an insult to God. I don't know if that's the way to say it but ... God made you a masterpiece. God did not make you a mistake." Last year during Hurricane Harvey, Osteen faced withering attacks online from critics who refused to believe he did not initially open the doors of his megachurch to shelter Harvey flood victims because he was worried about flooding in the massive 16,000-seat church. Many of Lakewood Church's staff and volunteers were themselves being rescued from floodwaters in their neighborhoods or helping to rescue others. "I don't spend any energy on the Twitter universe or social media," Osteen told ET's Kevin Frazier. "And I don't mean that disrespectfully. I just don't put any energy into it. I mean, life is too short to put energy into negative emotion and I feel at peace because we did the right thing."